The Europe and the Islamic World Seminar is designed for students interested in an academic and cultural experience in France, Morocco, and Spain. Students participate in a series of briefings from leading academic, literary, and political experts on the European relationship with the Islamic world. In each city, students attend daily lectures and meetings with distinguished scholars from IAU in addition to local guides and experts in the fields of politics, art history, history, and culture. Special emphasis is placed on the importance of immigration to Europe and its current socio-cultural implications on the region. View the 2020 itinerary here. Please note, the schedule is tentative and subject to change. View the 2020 syllabus here. Please note that details are subject to change. 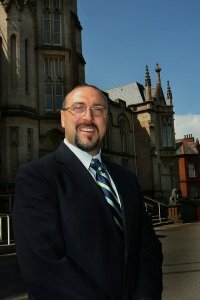 Dr. Carl Jubran, a 1992 alumnus of The Aix Center and previous member of IAU’s Council of Academic Advisors, became IAU’s fifth President in May 2011. He completed his undergraduate education in linguistics, participated in a Master’s program at the Sorbonne, Paris IV through New York University, and later earned his M.A. in Spanish Linguistics and a Ph.D. in Comparative Literature at the University of California. Dr. Jubran was a professor of Language and Literature at the University of San Diego (USD) and also served as Associate Provost for International Affairs. He has developed courses in French, Spanish, Arabic, world civilizations and global studies and has led and overseen programs in France, Mexico, Morocco, and Spain. Dr. Jubran’s multilingual fluency in French, English, Spanish, Arabic, and Hebrew positions him well to lead students, faculty, and staff in developing multicultural understanding and learning the essential importance of the interconnections among social equity and justice, economic viability, and environmental vitality in building sustainable community in today’s world.